Next stop on the Dão wine route was Casa de Santar, a beautiful historic family-owned manor house that’s also the biggest private estate in the region in terms of vineyard area: altogether Santar has 120 hectares of vines split between two locations. 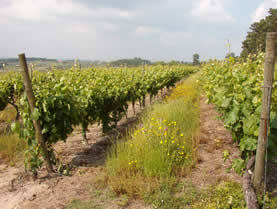 80% of this vineyard area is in separate varietal plantings (this is good for quality). Wines have been made here since 1616. French oak from Seguin Moreau, and American oak from Nadalie is used here: Santar were the first property in the region to use barriques. A typical mix of grape varieties are grown, with Touriga Nacional, Alfrocheiro and Tinta Roriz for the reds; Arinto, Cercial and Encruzado for whites. Winemaking is in the hands of Pedro de Vasconcellos e Souza (right), who showed me around. 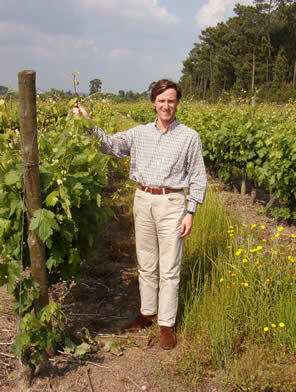 The winery has a capacity of some 3 million litres, of which 1 million litres are typically used in any one vintage. 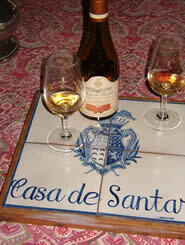 Some grapes are bought in, and the term Castas de Santar is used for the wines made from these (the estate wines are Casa). The wines are pretty reliable across the board – a consistent range, with the highlight unsurprisingly being the varietal Touriga Nacional.